Hello all, wherever you are in the world and I give you the heartiest of DC World welcomes to this, the latest edition of Confessions of a DC Geek. I can’t quite believe that this has reached edition #22 and I admit to having a lot of pride of that fact and that it appears to be a popular segment of the site. It doesn’t feel like over a year has passed since our very own Claire confessed all. 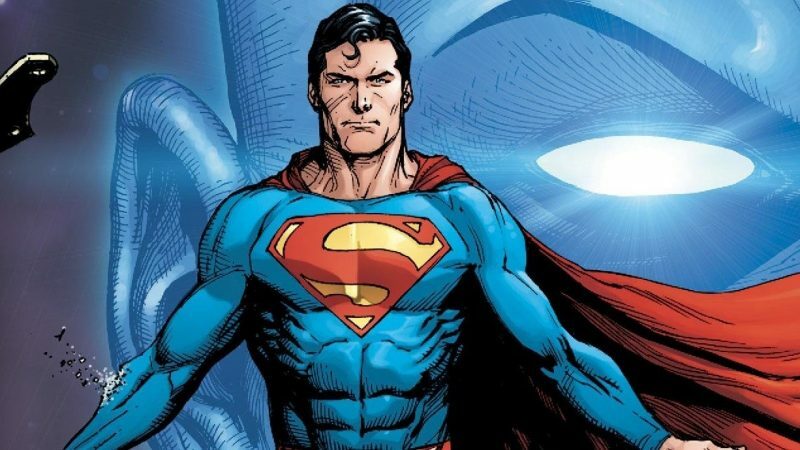 It’s testament to the DC World team as a whole that we are able to provide content such as this, as well as all the other brilliant stuff that the wonderful DCW team strive to get out to you, the readers and DC fans, for your pleasure. Anyway, I’ve gone a little off topic there so it’s on with the confessions of this edition’s victim willing participant, Sonny Whyte, a Superman fan if ever I saw one. It will quickly become apparent that Sonny would be a welcome recipient of the title of DC World Geek. Please enjoy, and if you would like to confess all yourself, please feel free to contact myself or the team on Twitter, you can even email me, john@dcworld.org.uk. Look forward to hearing from you. For now though, please enjoy. JH @DCW: First of all, would you mind telling me a bit about yourself – name, age (if willing), where you’re from and what you do for a living, anything else you wish to mention? SW: Hi my name is Sonny, 40 yrs. of age, I am from Liverpool and work for our local train company. 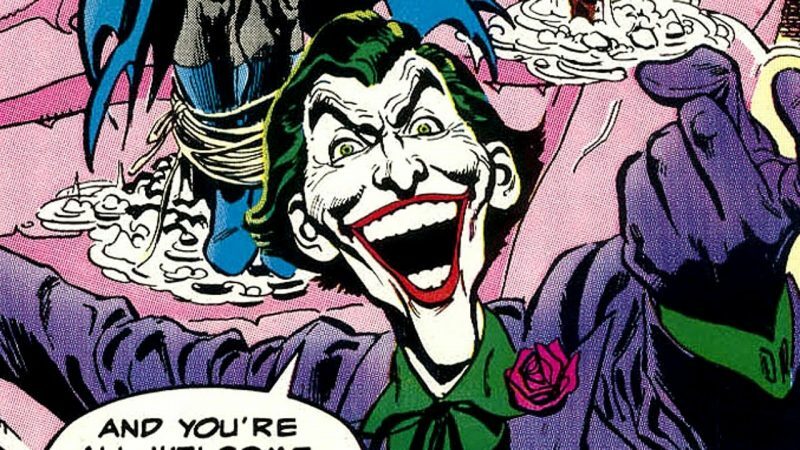 What, or who, helped kick-start your DC Comics fandom and when? It was the Christopher Reeve Superman movie; also the Michael Keaton Batman movie in ’89. Who is your favourite DC Superhero and why? 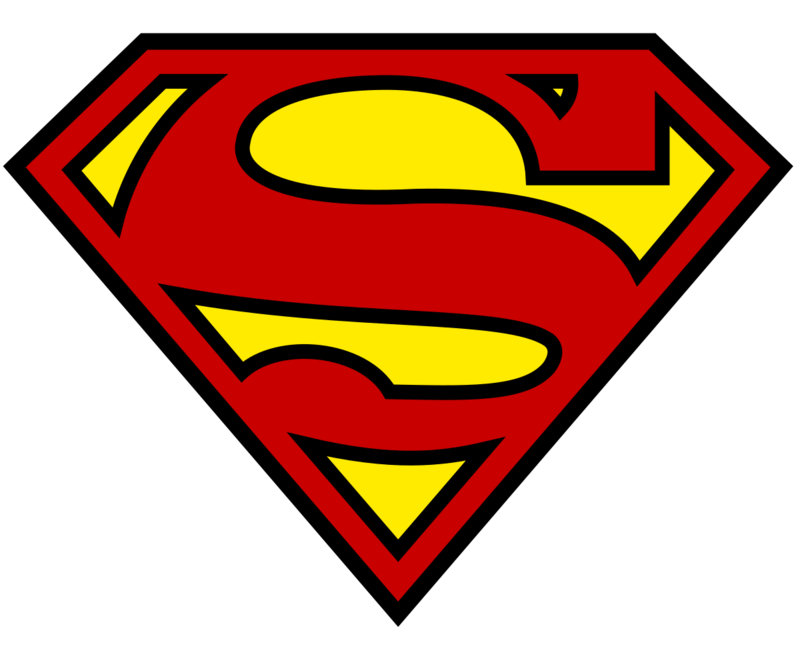 Superman, though he has the powers of a god he tries his best to act human, if not better than some of us ourselves. Who is your favourite DC Villain, why so? 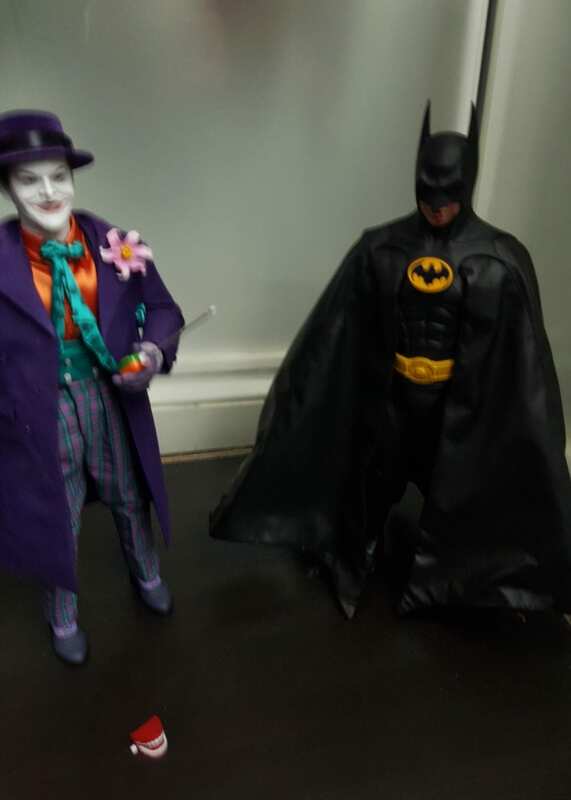 The Joker as he is normally concentrates on the Batman. He is unpredictable as well; he can play nice with others until it suits him and if anyone else goes after Batman then they’re in for it. Away from the two mentioned above, who is another character you could call a favourite, villain/hero/other character or one of each, what is the reason they are so great to you? It would have to be The Batman as he is only human. He is in the top three along Superman and Wonder Woman. 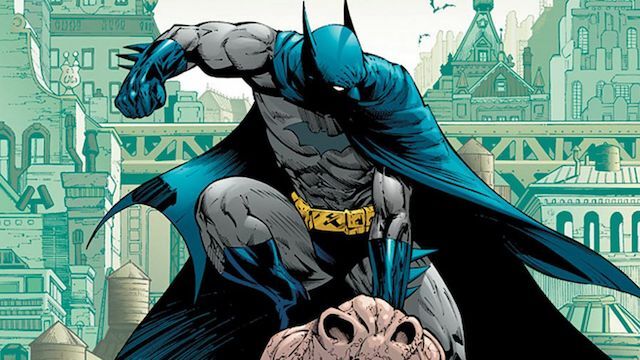 He has trained and dedicated himself to fighting crime the best way he can and he is the best at what he does. TV shows – which is your favourite DC effort, past or present? Lois and Clark: The New Adventures of Superman has to be one of my faves; I think with being in my teens in the nineties when it came out. Smallville for me was also amazing, seeing how Clark adapted to his powers and the struggles he went through, which was really well done. Plus there is the latest ones like Supergirl, Flash, Arrow and Legends of Tomorrow, which have been pretty good too. What is your favourite DC Movie? 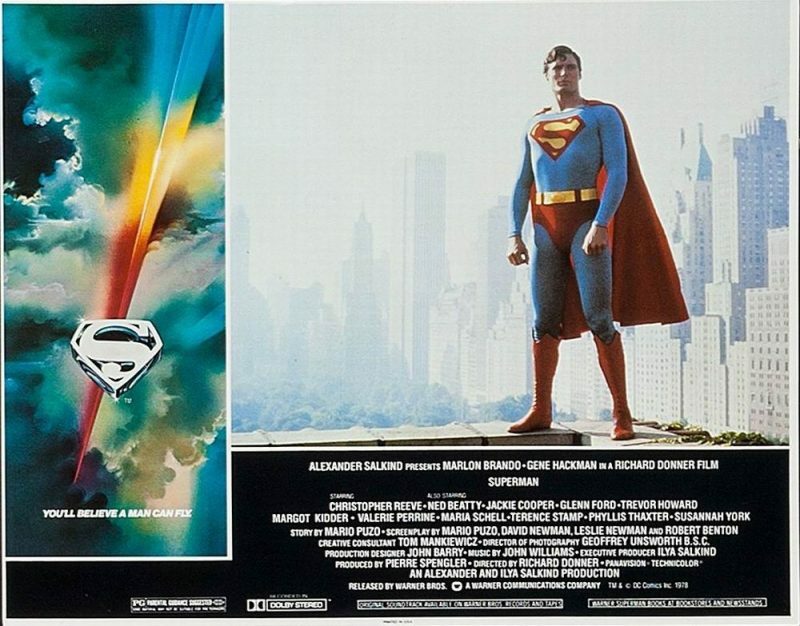 It would have to be Superman 2 (Which cut?………John). You meet General Zod and Superman has the ultimate battle with him, as well as against with Ursa and Non. I would also have to say Man of Steel is another fave as it has a different take on Superman’s origin. Are there any DC Universe characters, any that we haven’t seen a live action/animated version of so far, you would like to see become part of the movie, TV or even animated universe? If so, which character and who would you like to see play/voice the part/s? 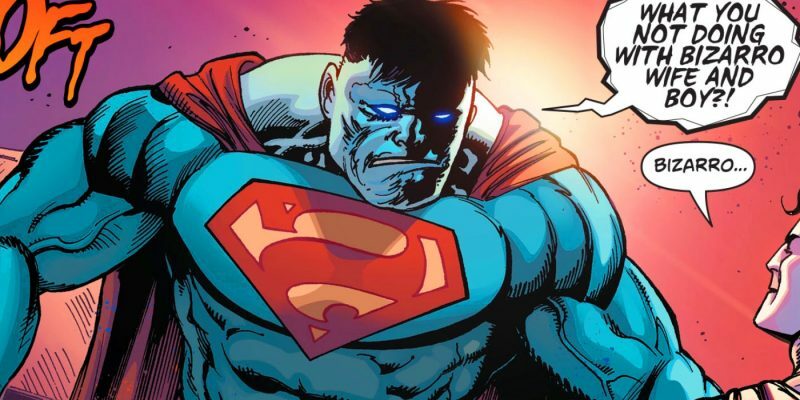 I would actually like to see Bizarro in a movie as it would be good to see Superman dealing with finding out he has a clone. 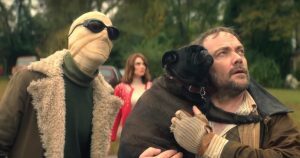 The actor playing this character would have to be whoever plays Superman or someone who looks very identical to them. The DC Universe has featured many, many actors on TV and in the movies, as well as voice acting for the animated movies/series’, so I ask you – who is your favourite actor, anyone who has made any kind of appearance within a DC creation? Now this is really a tough one as everyone who has played a roll in any of the DC movies or tv series has done a really good job. I will unfortunately not be able to answer this one as everyone who has played a character has portrayed it well and brought the characters to life in their own special way. Comics – do you read them? If so do you have a favourite series, or a graphic novel, that you enjoy more than others? Yes I love reading comics and I have loads of them in the house, alongside lots of Graphic Novels. My favourite ones would have to be The Death and Return of Superman, Batman: Hush and Green Lantern: Blackest Night. BIG Q1). Arrow – As we are all aware now, the Arrow TV show is to finish after a shortened season 8. It’s caused a stir among fans and for the most part, it is considered very sad news, though it will be going out on top (no doubt about that). What are your own personal thoughts on the show finishing? I was shocked and gutted to hear the news that Stephen Amell will no longer be playing the Green Arrow. I think he has done a really good job portraying Oliver Queen. I will admit I got a bit bored through season 4 but then it picked up again. BIG Q2). Further to the above question, I know that we have a Batwoman series on the way (very excited about this as I love Ruby Rose and what she did in the latest crossover – John), but do you feel that there are other DC characters that could make the jump from page to TV screen going forward, especially as the current shows will only last for so long? If so, which characters? I think we should have a Green Lantern show. In the Elseworlds you hear that when John Wesley played an alternate Flash he said hi to John and questioned that he wasn’t wearing his ring. Therefore, I think it would be good to see a Green Lantern series as well. If you were to fall in a swamp/be electrocuted/fall in a vat of chemicals/witness the death of a loved one etc. and made the choice to become superhero or villain, what would your name and powers be and what sort of costume would you go for? To be absolutely honest I think Superman’s origin story is the best but that’s because I am biased. If I were to have an origin I think I would have to be in a terrible accident, discovering I have come out of it unharmed and my powers would be super strength and invulnerability. 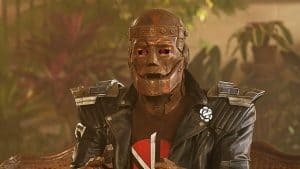 Apparel – do you wear any clothing that relates to DC Comics and its Universe, if so, do you have a favourite item of clothing that is still worn aplenty and fading? I have lots of superhero t-shirts, socks and a couple of jackets as well. One of my favs has to be a Superboy style jacket, black with a red ‘S’. The S is fading pretty much now but I still wear it to this day. Conventions – do you attend them and, if so, do you have a favourite convention that you have been to? Yes I have been to a few conventions and Liverpool has been the one I go to most. 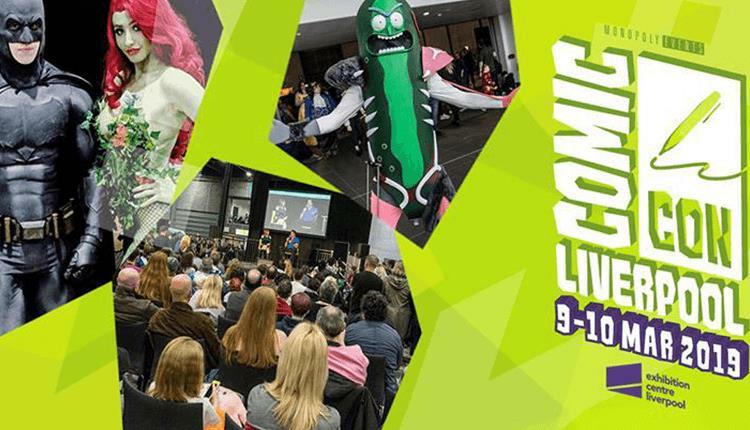 The best one lately has to be the Liverpool Comic Con that was held recently; I got too meet Dean Cain, Terri Hatcher and Jeff East. Before we go on to questions regarding your collection, if happy to do so, could you please tell our readers where we may find you online (Twitter, YouTube, Blogs etc.)? 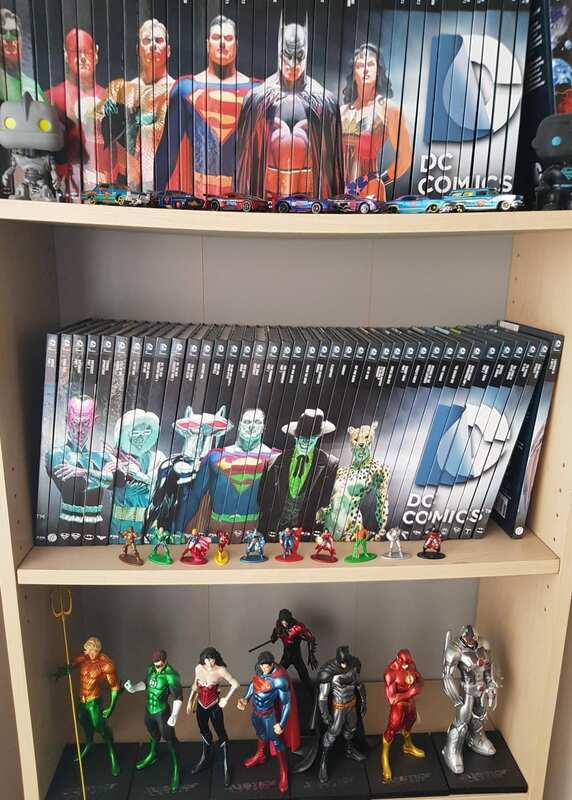 Now we have your confessions of all things DC, I’d like to ask about your DC collection. 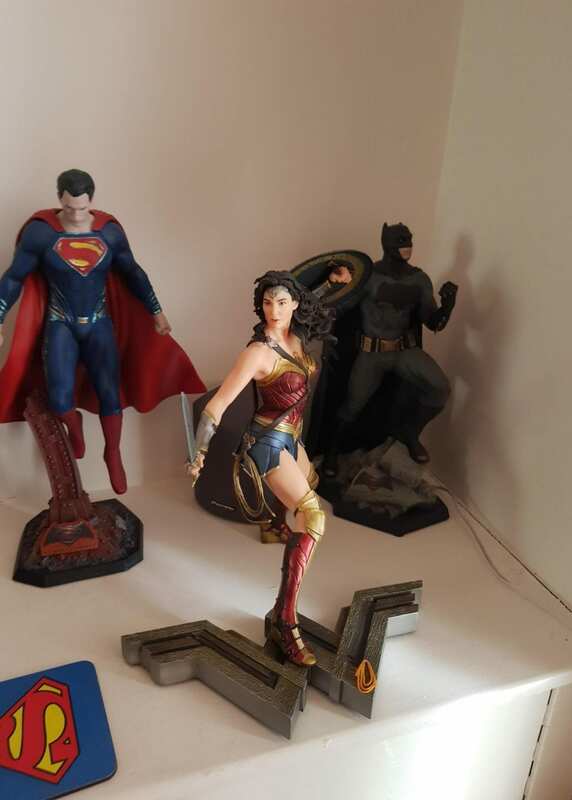 First up, do you collect large amounts of various and random DC merchandise or is there a single type of item that you like to pick up? 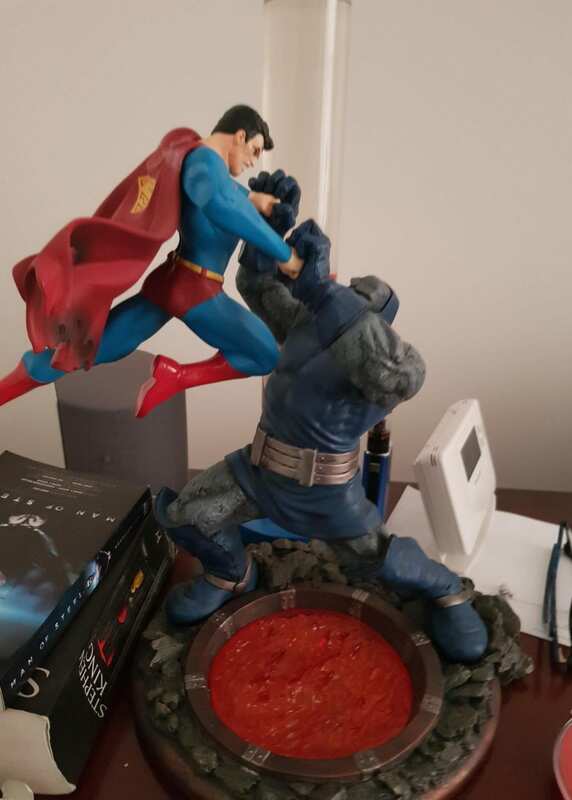 I collect statues, figures, glasses, cups, t-shirts, canvasses and pretty any kind of merchandise I can get my hands on. Do the collect items that are specific to a character/movie/TV Show etc. or do you collect all things DC Comics? Pretty much mostly Superman or anything to do with the Justice League. Thinking about the items you own, do you have a most prized possession? One that you cherish most of all, why does it mean so much to you? In your collection do you have anything that is considered a bootleg piece of merchandise? If so, what is the item and what made you buy it? Not really, all of my stuff is legitimate, DC licenced products. Do you have something in your collection that could be described as a rare item? I have a couple of old Superman comics at my cousin’s house from the 50’s and 60’s which I would class as rare, but whether they actually are or not is another question. When you want to show off your collection, what is you “go to” item? 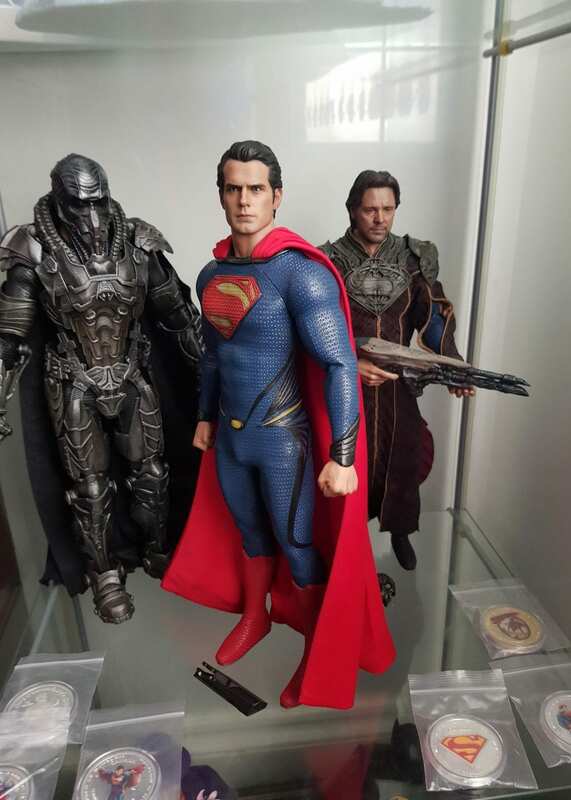 My Hot Toys collection of Superman, Man of Steel, Batman vs Superman and my Batman and Joker ’89. Going back to conventions again, if you attend, what sort of merchandise do you like to pick up, or do you prefer getting to meet the celebs and receive photos/autographs etc? Comics, pictures, artwork, figures, statues, anything really. What are the biggest and smallest items in your collection? 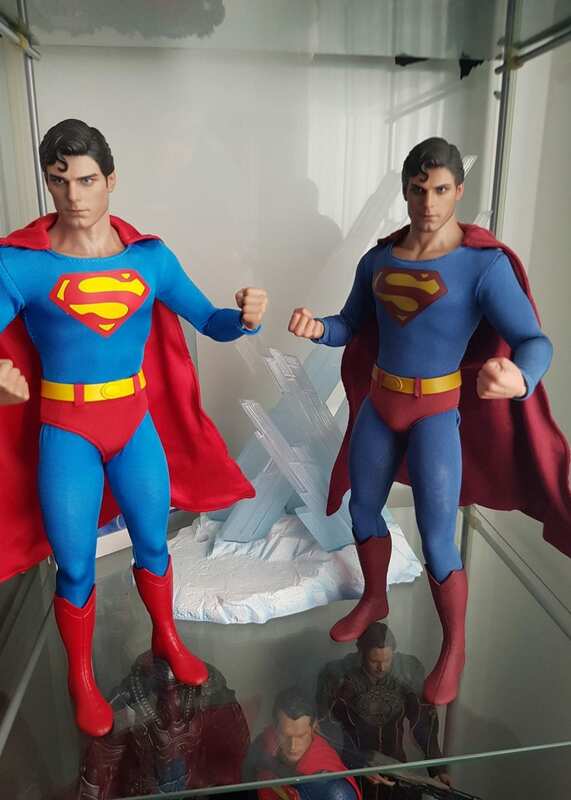 My Neca Superman figure of Henry Cavill and the smallest would be a Superman Canadian coin. What is the most and least expensive or valuable item that you have purchased to add to your collection? 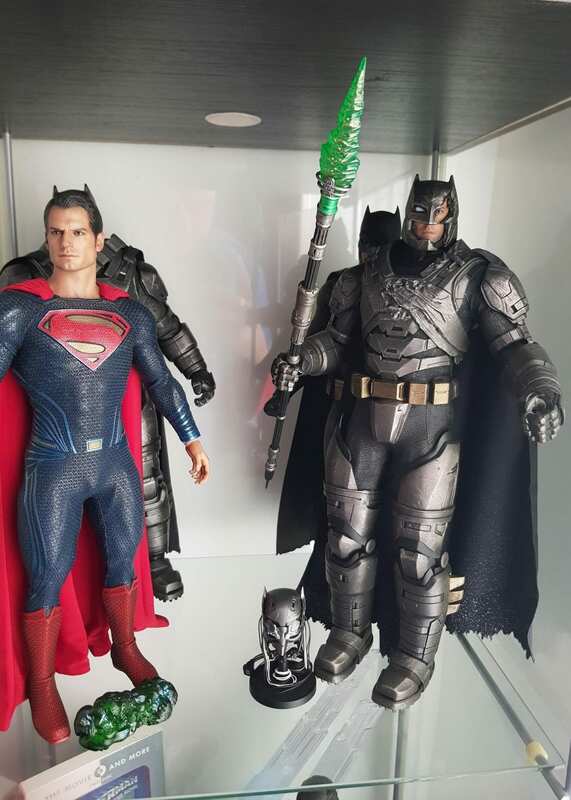 My Batman damaged armour from Batman vs Superman Hot Toys figure is the most expensive. A mini superman figure from Man of Steel has to be the least expensive. Is there a Holy Grail for you, an item that you would love to own that may prove to be extremely difficult or even impossible to obtain? The one and only Holy Grail for me, something that I would absolutely love to own, is Action Comics number one. Finally – away from your confessions and collection, what are your hopes going forward for the world of DC Comics? Please feel free to write about all mediums (TV/Movies/Comics etc.) that you wish. I hope that Henry Cavill will stay as Superman, because I think he has done a really good job portraying him. I can’t see anyone else filling his shoes to do that role. Comics I am really enjoying, so I can’t fault any of them to be honest and the tv series have been going really well. I have been enjoying them so far and not disappointed at all. And there we have it, I know it is very disappointing when full confessions are out in the open but they do have to end at some point. My thanks go to Sonny for taking the time to answer the questions put to him, always very much appreciated by myself and the whole team. We all enjoy reading these and it’s great to get some insight in to what, from the DC Universe, makes you guys tick. Please, please feel free to comment below or on our social media pages, hearing from you guys is always a pleasure. The site is run by fans of DC, for fans of DC. Plus, if you want to take part, details are at the beginning of this article. Be great if you get in touch.